No matter who’s dishing the money out, even a smaller wedding with simple catering can amount to more than you would’ve bargained for. Rather than selling your organs to put down those deposits, use these money-saving wedding tips instead. If you’ve already sent out the save the dates, then you’re a little too far past this point to make an adjustment. However, if you’re just starting your wedding planning adventure, then you can save a lot of money. You can start by picking the right time to get married. That really comes down to two factors: time of year and day of week. 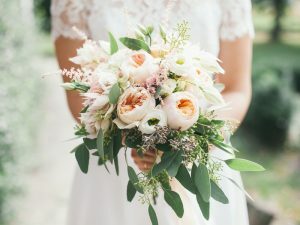 Getting married in one of the most popular months of the year for weddings is a sure-fire way to blow your wedding fund. Months like June and October are extremely popular wedding months. It might behoove you to pick a different month instead. Likewise, getting married on a day where weddings are more common, such as a Saturday, will also break the bank. It might be easier for your attendees to make the big day if it’s on a Saturday. You can also opt for a Friday or Sunday. These days can quite possibly save you thousands of dollars. As soon as the question is popped, many couples go into full-blown wedding planning mode. Before you know it, your wedding day is right around the corner. Instead of rushing toward the big day, take your time! Your engagement is the perfect time to save money. Plan out the details, and look for ways to save money for your future. The average length of engagement is 14 months, according to the Knot’s Real Weddings Study. That should give you ample time to plan a perfect wedding. One that fits your wedding planning budget. There’s no time limit on how long you have to be engaged before you get married. Take as much time as you need. Booking venues and caterers more than a year in advance is a great way to lock in rates and ensure a low-cost wedding. Whether they give you a reason to believe it or not, your friends and family can be great resources during your wedding planning. Recruit your friends to help make centerpieces, ask your parents to borrow their old karaoke machine, and ask a trusted friend or family member to officiate your wedding. Officiants can cost you more than you probably anticipated and can really scrap your budget. There are organizations that will ordain people so that they can officiate a wedding, so consider asking someone close to you for a truly special (and low-cost) wedding day. Finally, we come to the biggest wedding budget-buster of them all: unrealistic expectations. After a lifetime dreaming of their wedding day, too many couples rush into wedding planning without budget planning first. A venue in an expensive city, for example, will most definitely be more expensive than one in a quieter suburban venue. Put it this way, you wouldn’t move to New York City with the expectation of buying a 3,000 square foot condo for $50,000 (the average condo in New York City costs $1.9 million). So while Meghan Markle may have gotten the fairy-tale wedding of her dreams, most couples will have to compromise during the wedding planning process. In an ideal world, every wedding would be a complete and accurate representation of whatever your heart desires. Unfortunately, that costs a lot of money in the real world. Using these money-saving wedding tips can help bring that dream a little closer to reality.